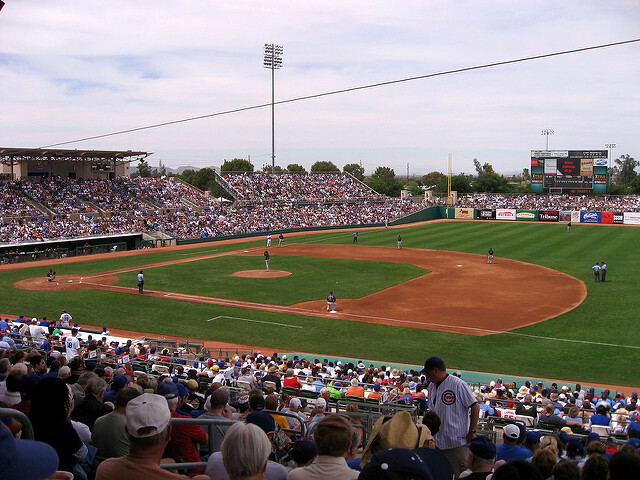 Mesa's Hohokam Stadium has hosted both the Chicago Cubs and the Oakland Athletics; its long history reveals the history of Cactus League Baseball. Until 2016, the Chicago Cubs have been America’s lovable losers for over a century. For 35 of those years, the Chicago Cubs spent their springs preparing for a grueling season just west of Center Street in North Mesa. Hohokam Stadium opened in the spring of 1977, hosting the Oakland Athletics of the American League. 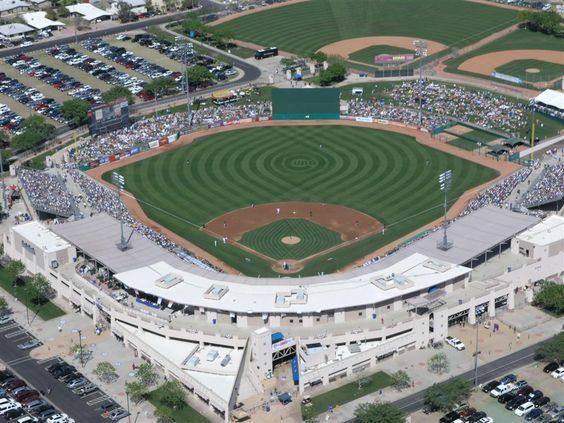 Built to replace the old Rendezvous Stadium, Hohokam Park quickly became a crown jewel of Mesa. In 1979, the team from the North side of Chicago returned to Mesa after a 12-year tenure in Scottsdale. For over three decades, Hohokam Park, as it was then known, was Chicago’s home in the arid Arizona Desert. Much like the friendly confines at Wrigley, Hohokam Park did not enjoy the finest amenities. Described by some as having, “all the charm of an abandoned drive in movie theater,” Hohokam reminded many a dislocated Cubs fan of home in the windy city. By the mid-1990s, Hohokam Park was the place to be for spring training. Despite the stadiums lack of glam, it was the epitome of Spring Training experiences. It drew sellout crowds of die-hard Cubs fans, and transported huge swaths of baseball fans in a way to Chicago. The air, the ambiance, the smells, all harkened back to Chicago. Except, as one author points out, “not everybody is anxious to read about the latest exploits of Shawn Dunston or Ryne Sandberg. Nah it’s just fun to read the temperature chart and imagine your neighbor with a snow shovel while you bask in the sun.” It was not uncommon for fans and visitors to interact with Cubs greats from the 1980s and 1990s, with longtime Cubs announcer Harry Carrey being amongst the most popular. Even with abysmal performances by the Cubs throughout the 1980s, Hohokam enjoyed record turnouts during the spring. The Cubs continuously ranked at or near the top for attendance and they quickly became the top draw for a floundering Cactus League. In 1991, the stadium at Hohokam Park is officially named Dwight W. Patterson Field, the same Dwight Patterson who is now known as the father of the Cactus League and was integral to bringing major league baseball to Mesa. However, the intimate and nostalgic feel of Hohokam did not stop the slow creep of Mother Nature. Despite the record attendance and popularity of the Cubs, Hohokam was quickly turning from a crown jewel to an eye sore. It was a good day if the scoreboards turned on, let alone functioned properly. The seats succumbed to long years in the Arizona sun, and fans complained of dangerous conditions on the concourse. By 1997, it was clear that Hohokam Park desperately needed a remodel. 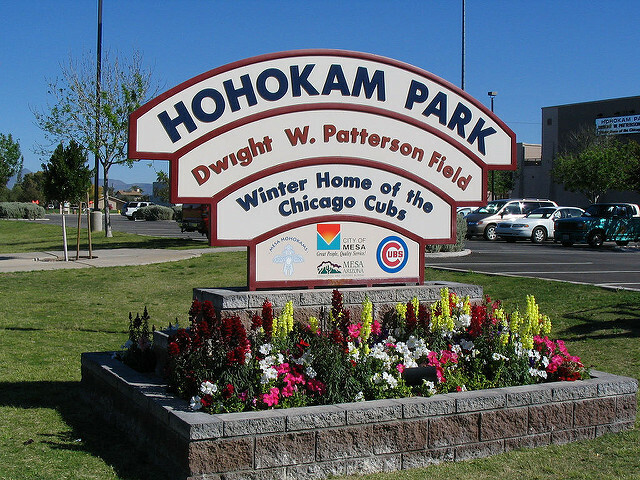 Support from area residents, as well as the snowbirds from Chicago, helped play a role in the development of an expanded and remodeled Hohokam park. This remodel saw the addition of nearly 2,500 seats and updated amenities. The Cubs would continue to enjoy the friendly confines of Hohokam until 2014. With the opening of Sloan Park, Hohokam was forced to find itself new tenants. 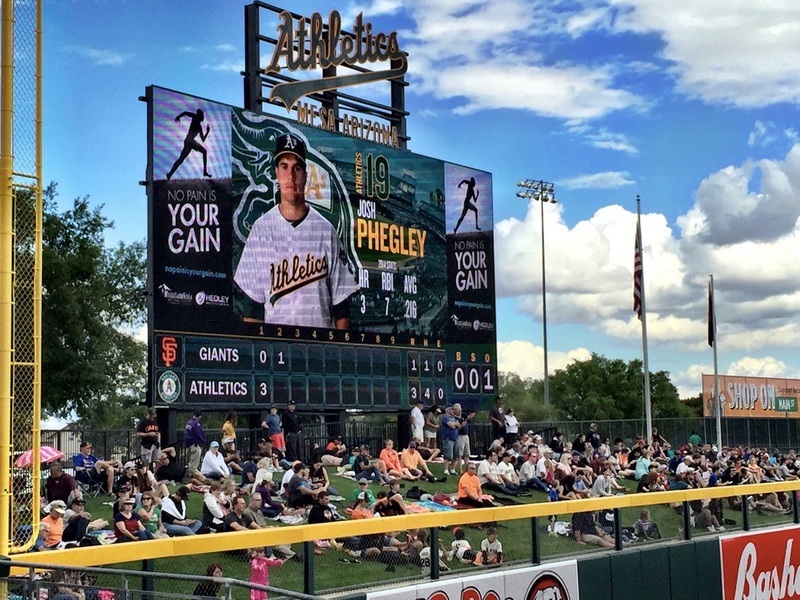 Spring Training 2015 would see the return of the Oakland Athletics to a newly renovated Hohokam Stadium. Hohokam today is a far cry from the facility of the 1980s and 90s, with High-Definition scoreboards, all new seats, and expanded seating areas to allow visitors new locations to take in a game. View of the scoreboard from the third base stands: This picture shows the new HD scoreboard located in left field, as well as the renovated grass and picnic seating in left field. The renovations were done as part of the A's efforts to make the stadium state of the art. ~ Source: Spring Training Online. March 5, 2015. Accessed December 7, 2016. http://www.springtrainingonline.com/reviving-hohokam-stadium/. A day at the ballpark: Fans can enjoy an number of modern amenities now at Hohokam. Although this picture dates to before the A's renovation efforts, it still highlights the comfy confines of Hohokam. 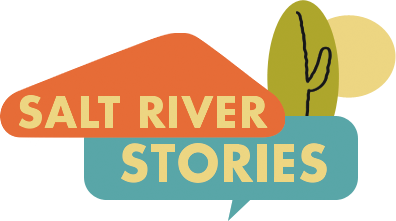 Connor Hillmann, “Hohokam Park ,” Salt River Stories, accessed April 18, 2019, https://saltriverstories.org/items/show/203. Frauenhiem, Norm. "Cubs Fans Content with Bear Necessities." The Arizona Republic (Phoenix), March 19, 1994. "Hohokam Stadium: New Life for the Old Lady." Ballpark Digest. 2015. Accessed December 08, 2016. http://ballparkdigest.com/2015/03/04/hohokam-stadium-new-life-for-the-old-lady/.